The boundaries of the patterns and individual details with this methodEmbroidery is treated with a stitch, the fragments of tissue that do not participate in the pattern are cut out. It was traditionally to embroider white on white. But now it is permissible to perform embroidery with any color on fabrics of different colors and in tone, and with contrasting threads. Richelieu has many names for embroidery. Refers to this method of decorating items for embroidery"Urban type". Fashion to expand things began in Italy in the XIV century. In Western Europe, art occupied its niche by the 16th century, and wore products embroidered in this way by mostly noble townspeople. They decorated table linen, collars of court suits, handkerchiefs, bedclothes of the royal family and those close to the higher world. It is said that Cardinal Richelieu himself was very good at embroidering this way in this way! And in his honor the sewing method got its name. In fact, the embroidery appeared before the cardinal. There are a lot of ways to embroider a Richelieu. With the Venetian seam, and so on. During the Soviet era schemes for the Richelieu were printed in magazines devoted to needlework, now it is easiest to find drawings on sites for embroidery. Choosing the drawing you like, you need to specify, are these schemes prepared for machine embroidery Richelieu or for manual? Since each kind of drawing has its own specifics. How to start mastering this kind of applied art? Schemes of embroidery Richelieu, designed for beginners, it is best to choose simpler. It is better, that the basic ornament consisted of simple details, the figures were overlapped on top of each other. 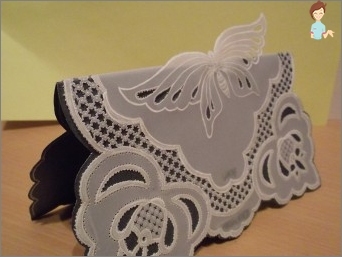 If the pattern seems simple, it can then be decorated in addition, with some sutures from other ways of needlework. Calculate the severity of the thread. Advice for beginners: it is most convenient to take a thin wool or floss, which then passes through the needle in several additions. Cut the fabric from the inside. Therefore, it is necessary to prepare in advance the sharp scissors with a curved edge - the manicure is the best. Near the edge of the stitches, you will have to be very careful. All elements of the pattern are stitched, the needle is inserted over theDirection of motion. Stitched out the embroidery schemes of the Richelieu in several rows, between which there should be small gaps. Thick materials are stitched with thick silk, thin - floss. It is acceptable to use coil threads. Next, jumpers are called bridges. For this, the thread is pulled between parallel rows of basting, flipping from one element of the drawing to the other. The thread, which is being executed, is traversed in the interval between the rows of basting and stretches back. The brides are sutured with a stitched seam. The fabric under the lintels is cut. Then, the edges of the cuts are also traced. After the end of the lapping, you can already evaluate the results of your work. For the first experiment, it is best to take light-colored cloth, and thread dark - or vice versa. Work with contrasting colors beginners easier. Then the workpiece is made: To the fabric are glued both types of non-woven fabric - one on top of the other, water-soluble, glue. And the whole sandwich is very carefully fixed on the frame - if the fabric is bent, embroidery will not work. The scheme of machine embroidery Richelieu for beginners is best chosen with floral motifs, consisting of large parts. On the nonwoven there are further bridges-lintels. After the end of work, the water-soluble fleecelet is washed off, the product is ironed. If there is no opportunity to purchase a water-soluble fleece, embroidery with a Richelieu pattern for beginners becomes somewhat more complicated. Elements are also subtracted by a straight line withSmall step, and then, without removing the cushion thread, the contours are swept with a zigzag. Cut out the material after the scheme is ironed, that is, at the last stage. In addition to the stitching, there are other ways of winding the jumpers. You can make a bride with denticles: The stitch is sewn on 2/3 bridges. Then the thread is fixed at the level of 7 stitches, returned back, fixed, again returned and again fixed. If you now finish the jumper with a stitched seam, then it will have characteristic denticles. Pin-pin: Stretch a few threads between the markings and twist around the winding stitch, stitches which are laid at a minimum distance. These stitches are stretched symmetrically from each side of the lintel. Regularly doing embroidery, you can learn a lot of interesting techniques. The product will look like a work of art. Finishing the Richelieu will add extra plus embroidery beads. The thing decorated in this way will look richer. Embroidery with beads is done separately. Beads threaded on strings are laid out in the form of eddies in carved places. It looks very nice, but if the thread breaks, then all work will have to start anew. In the decoration of things intended for socks, this method does not apply. The most versatile method of azhur with the use of bead-beads - to sheathe the edges of the drawings intended for embroidery Richelieu. And already the decorative cuts do then. So decorate the collars, cuts dresses and blouses. 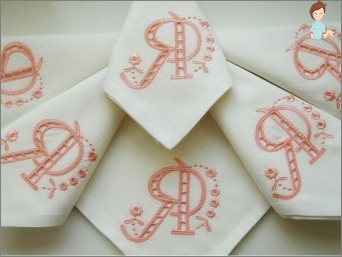 Embroidery Richelieu is able to turn any product into an exclusive. Richelieu will transform the products of your wardrobe and make them truly unique!